From the Reconstruction era to the late 1950s, the use of prisoners in chain gangs to perform hard labor, especially in building and maintaining public roads, was a common practice in North Carolina and throughout the South. Established by law as a means of punishment in the late nineteenth century, working on a chain gang became a standard sentence for vagrancy and petty larceny, although in North Carolina it was also inflicted on any able-bodied male prisoner serving a sentence of up to ten years. Living conditions for chain gang convicts were frequently horrific, with sanitation practically nonexistent and diseases and illnesses common. This was especially true if prisoners were housed in temporary living quarters-often railroad boxcars or caged vehicles easily transported from site to site. Prisoners frequently suffered at the hands of brutal overseers. Over time, the image of men, many of them African Americans, shackled with leg irons to prevent their escape came to symbolize the cruelties of imprisonment as well as the injustices associated with racial and economic inequality in the segregated South. The most extensive use of chain gangs in North Carolina coincided with the rapid growth of highway construction accompanying the Auto Age, from 1900 to 1950. 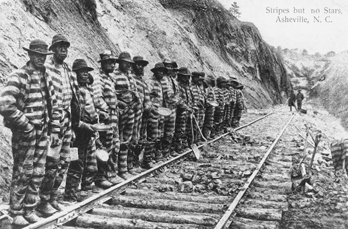 A number of reforms in the 1920s were intended to end the worst practices of chain gangs. Eventually, the chain gang was operated as a daily road crew that lived in permanent prison facilities nearby. With the advent of more mechanized heavy equipment for road building, the need for labor gangs decreased. After this, contracted paid laborers constructed state roads, and prisoners began working primarily in beautification projects and litter control. Jesse F. Steiner and Roy M. Brown, The North Carolina Chain Gang: A Study of County Convict Road Work (1927). Chain gang working on a railroad near Asheville, 1915. Copied from a postcard. Courtesy of North Carolina Office of Archives and History, Raleigh. Call no. N_71_9_145. The North Carolina chain gang; a study of county convict roadwork by Jesse Frederick Steiner and Roy Melton Brown, 1927.